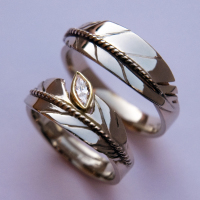 With the traditional stories and imagery of Zhaawano’s ancestors and their spirit of wisdom and creativity shining through, Fisher Star Wedding Rings creates a highly contemporary statement of quality and style just for you. 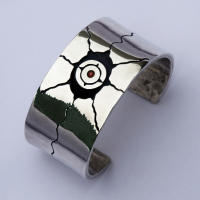 We offer you a choice of images that reflect Zhaawano's wedding ring and clan ring designs as elegant and unique expressions of Native American spirit, merging today's aestethics with the spiritual/artistic expressions and themes of generations past. Each new design that leaves Zhaawano's workbench is a modern storyteller medium that speaks a visual language that is deeply rooted in the oral and pictorial traditions of his Native ancestors, the Ojibwe Anishinaabe Peoples from the rapids and waterfalls of what is now Michigan's Upper Peninsula. 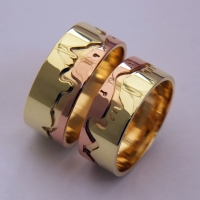 Browse the website and let the story richness and magic symbolism of Zhaawano’s wedding ring collections enchant and inspire you. 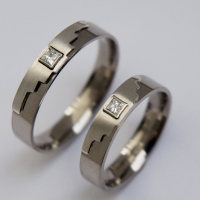 Then contact the jeweler and he will gladly assist you and your partner with making these stories into your OWN story, that could only be told by YOU. 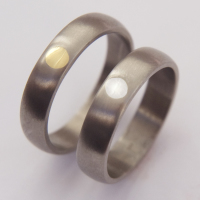 Your wedding rings are not only beautifully crafted but share valuable teaching stories as well. Hay-hay! 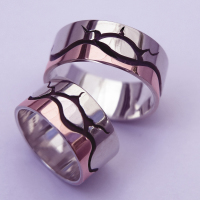 Stunning wedding ring collection, great stories. Meegwetch! Then pick a special set or piece that speaks to your soul, that you both will love and treasure for as long as the trees and the flowers grow and the sun and the moon and the stars shine high above. 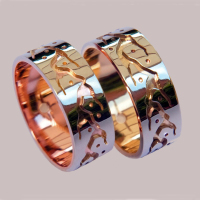 When ordering, make sure to mention the exact sizes of the wedding bands of your choice. Please note that professional sizing methods are more reliable and accurate than online or at-home methods. Professional sizing can be done at a local reputable jeweler. It is important to take into account the width of your band as wider bands typically require a larger size to fit comfortably. 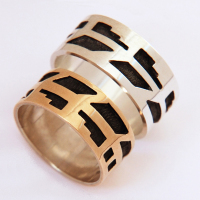 It is therefore always best to be sized with a ring sizer of the same width as that of of the ring you intend to purchase.